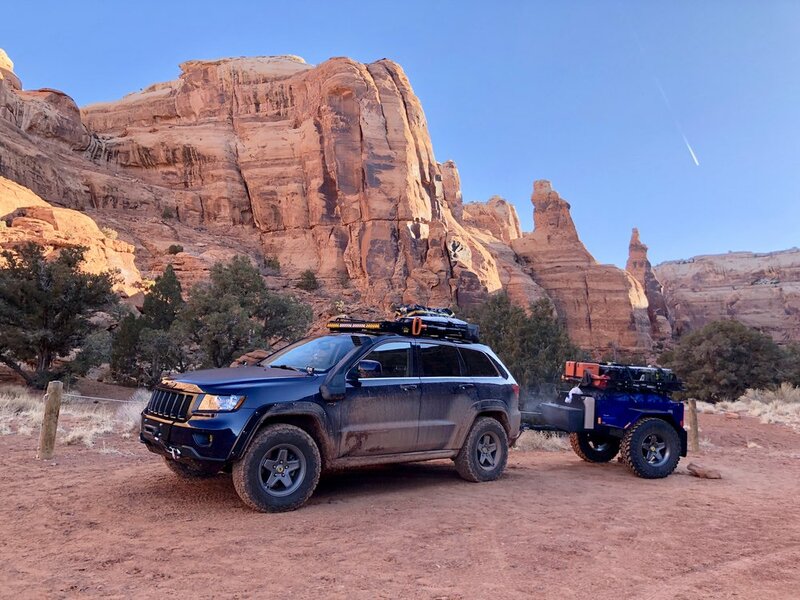 One day, two night adventure with the Triple Aught Design community around Moab, Utah…. Triple Aught Design “Waypoint” events are brand community adventure events meant to be accessible adventure where you provide your own gear for a day. This is the second Waypoint event we have attended, and it is still the favorite. Friends old and new traveled from Colorado, Texas, and Arizona for a day of off roading and exploring around Moab, Utah. 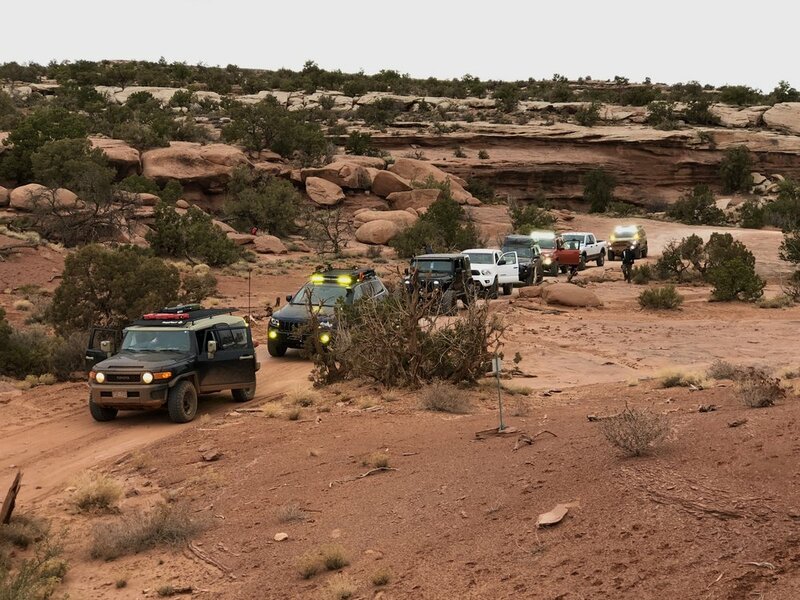 Since nearly everyone was coming in from out of the area, most of the team met up the night before at the trailhead to navigate into our undisclosed campsite. It was February in Moab, so it was a desert chilly that turned into sub-freezing overnight. The next day, rain, then snow, then back to sub-freezing overnight again awaited us. We were all quite happy to have had our Triple Aught Design clothing and gear along! After a rousing night around the campfire making new friends, catching up with old ones, and even celebrating a birthday with whiskey and a cigar, we turned in for a full day of adventure ahead. On Saturday morning, we dug out of our sleeping bags and readied for the day’s adventure. TAD staff passed out some very cool clothing and gear for us to try out, and we had a trail briefing. The plan was to navigate the trail down the canyon and up to the top of the Gemini Bridges, a notorious double arch formation. The vistas were breathtaking the entire way with the red sandstone canyons contrasted against the snow-capped LaSal mountains in the distance. After reaching the Gemini Bridges, we dismounted and began our explorations on foot. The arches are not just spectacular in their own right, but the views over the Behind the Rocks area and out to the LaSals just made it dig into your senses. While there, a geocache was located and we added a TAD morale patch signed by the team members to the old ammo can under the outcropping. It was hard to leave, but we had more adventuring to do! By the time we got back into the town of Moab, it was about lunchtime, so we made a stop at the Blue Pig for some BBQ lunch. Afterwards, we headed back out of town towards the Birthing Rock which displays centuries worth of ancient native rock art. The rain had started in earnest by this time, and would punctuate the rest of the day. Our next stop was to locate and climb up to Cable Arch. This ended up requiring some slot canyon type climbing, and the rain was getting heavier, so we backed off of this attempt in deference to safety. Even localized rains can cause flash floods in canyon country. The team decided to continue on to Hurrah Pass in the distance as weather allowed. The rain and varied cloud cover in the redrock canyons and cliffs lent a mystical feel to the day. It just made the whole experience feel more adventurous. The views from Hurrah pass in the breaking weather were truly epic. Moab is so much more…more in bad weather. The clouds give scale to the rock formations and subdue the red sandstone to even more ominous reds. The day was waning, so the team broke off from the pass. Some headed back to camp to set up dinner and the campfire while the balance of the team made a final, successful attempt to reach Cable Arch in the setting sun. Back at camp, ravens had made a mess of some trash bags during the day, and one tent even got blown away by the day’s storms and had to be located in the canyon. The final night was thoroughly enjoyed around a roaring campfire as it began to lightly snow. Almost everyone had to leave before sunrise the next day, so we grudgingly turned in a braced for a truly frigid night in the high desert.